A gorgeous and taut literary drama in the vein of We Need to Talk about Kevin, from the critically acclaimed author of The Blessings, about a mother and daughter struggling with guilt, fear, and the dangerous bonds of family in the aftermath of a mass shooting in their small New England town. After a shooting in her local mall in rural New Hampshire, English professor Maggie Daley is surprised to learn the gunman was her former student, and chagrined when she finds an old essay offering clues to his violent nature she might have missed. Even as the tragedy begins to fade from the national consciousness, it takes up a larger and larger part of Maggie's attention and obsession--and it begins to disrupt her relationships with her anxiety-ridden daughter, her ex-husband, and her new lover. Meanwhile, both Maggie's employer and a determined blogger, separately, are digging into the shooter's troubled past. Feeling pressured from all sides, Maggie begins to fear that her culpability may extend past a simple sense of guilt and put the life she's built at risk. 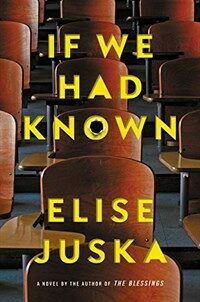 IF WE HAD KNOWN explores the private implications of public tragedies, how we navigate fear in today's world, and whether it's possible to see anyone--spouses, parents, students--as they truly are.